Do a favor by slaying a bandit leader. This is a radiant quest which you can receive from any of the following four people. Apart from Ahtar's quest, which has a fixed location, the dungeon is randomly determined based on the quest giver's hold. Talk to the quest giver. Travel to the bandit lair or dungeon. Return to the quest giver for your reward. If you kill Captain Hargar during the quest Lights Out!, or by clearing out the grotto without the quest, then Ahtar won't give you his quest and can never become a follower. If you have only recently cleared Broken Oar Grotto, it may be possible go back and resurrect Captain Hargar using console commands, unless his body has disappeared. The quest should then be given. This is not the case with the Unofficial Skyrim Patch, as it adds Orphan's Tear and Ironback Hideout as possible targets. The quest Harsh Master can have identical quest objectives. If you do the quest Lights Out first, the captain may be extremely high level to prevent you from killing him and forcing you to leave without clearing out the cave. This allows you the possibility to still get the other quest from Ahtar. 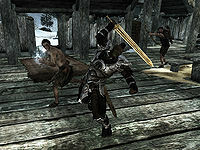 (Brunwulf Free-Winter/Uttering Hills camp version) If you have already completed Summerset Shadows for the Thieves Guild, you will be unable to complete this quest, as the bandit leader Linwe will already be dead, but there will be an objective arrow pointing to him as if he still needs to be killed. If Linwe's body has already disappeared, typing setstage Favor104 15 in the console will advance the quest. If setstage Favor104 15 doesn't help you, type the following commands: prid C5688 and then kill. This should select the original quest target and kill him for you, advancing the quest to the next stage. If prid C5688 doesn't help you, type the following commands: prid C5675, then disable, and then type prid C5675, then enable, and finally resurrect. This should place Linwe at the empty chair where the quest marker is pointing. Additional Summerset Shadow thieves should spawn as well. If all previous codes don't work, try prid 7d67a, then resurrect and finally kill. (Brunwulf Free-Winter/Gallows Rock version) Gallows Rock is where The Silver Hand quest takes place for the Companions. Upon re-entering the area, the enemies had respawned and Krev the Skinner had respawned and doubles as the bandit leader that Brunwulf Free-Winter is referring to. Annekke Crag-Jumper or Ahtar may not give this radiant quest, even if you have no other active quests that could possibly conflict with it. This renders it impossible to recruit them as a follower. It is possible that both Annekke Crag-Jumper and Brunwulf Free-Winter want to give the same location for this quest, but as you cannot have more than one of this quest active only the first one you entered the map cell of will have the dialog option, the other will not offer the radiant quest. A possible fix to finish the quest for the first one, then to wait 30 days until the dungeon reset (while never having entered the map cell of the other quest-giver). The dialog option should appear for the second one too. ? On the PC, it is possible to use the console to advance through the quest by entering setstage Favor104 stage, where stage is the number of the stage you wish to complete. It is not possible to un-complete (i.e. go back) quest stages, but it is possible to clear all stages of the quest using resetquest Favor104. This page was last modified on 2 February 2019, at 17:25.